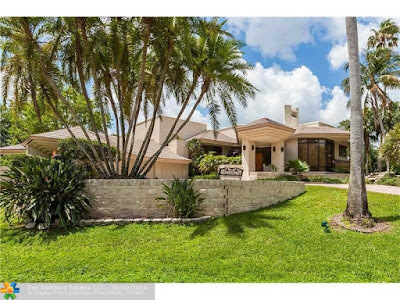 Broward Real Estate: Windmill Ranch Estates Home For Sale! Windmill Ranch Estates Home For Sale! This designer showcase twelve thousand square foot home with six bedrooms, six bathrooms and three half baths is located in prestigious Windmill Ranch Estates in Weston. This fabulous Frank Lloyd Wright inspired home sits on an exquisite lakefront one and a half acre lot with spectacular pool area and water views. The chef's dream kitchen boasts custom modern wooden cabinetry, a full suite of designer appliances, and sleek granite counter tops. The flooring throughout the home is beautiful marble! The home features soaring ceilings. There is a cozy fireplace for those chilly Florida nights. There is a full wet bar that overlooks the lush tropical outdoors perfect for entertaining. The home also has an in home theater. This home was Awarded House of the Year for outstanding craftsmanship by the Construction Association of South Florida. Weston is a great city and has it's own town center for dining, shopping and entertainment. Weston Town Center is a premier one of a kind shopping center. Located just minutes from I-75 on the corner of Royal Palm Blvd. & Bonaventure Blvd. Weston Town Center features upscale salons, boutiques, casual & fine dining and an array of unique services. Delray Beach Fourth Of July Bash 2016! Venetian Isles Waterfront Home Just Listed! Waterfront Estate On The Market In Davie!